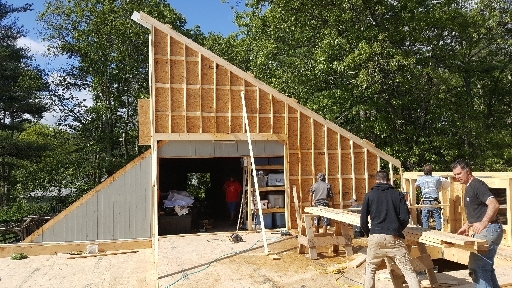 The story on this page is a selection of interesting photos in the directory: Wildstar Barn Construction. 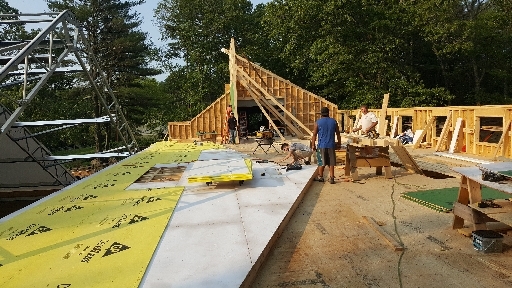 The complete set of photos is available at: Wildstar Barn Construction. 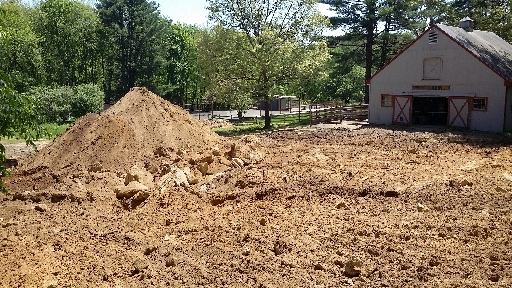 This building permit is for the foundation and the construction of the indoor riding arena. Getting the permit is the first major accomplishment of building Wildstar Farm. 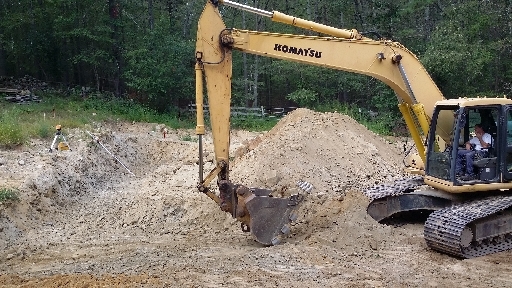 On the first day of digging this pile was made near the barn. Lots of rocks lie under the surface. 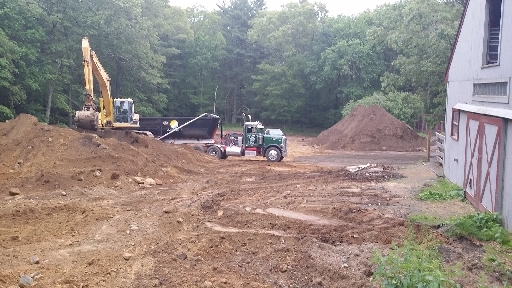 On the second day part of the first pile was removed and a pile of loam was stripped off the second half of the arena area. 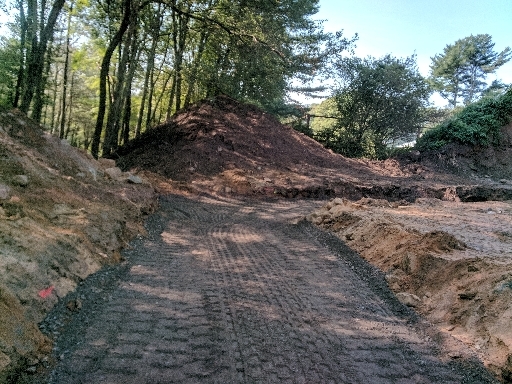 After stripping loam from another section a few inches of gravel was brought in to make a 'road' for construction vehicle access. 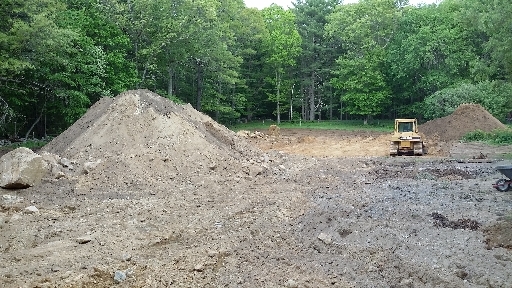 This broad area will eventually be restored to being a paddock with a small road leading through it. 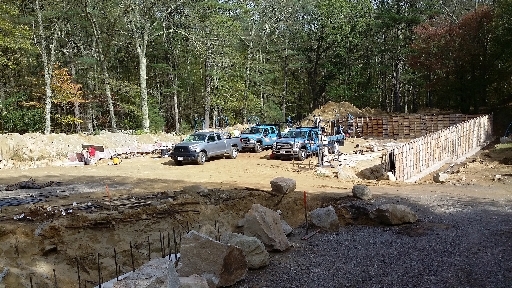 During construction it is more like a parking lot. 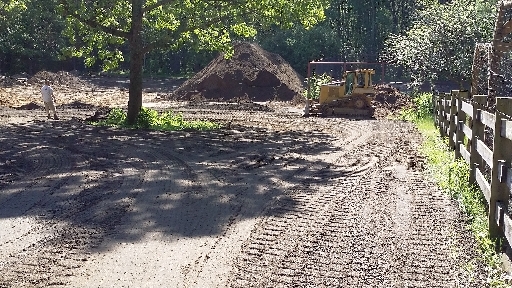 About two thirds of the loam was carted away. 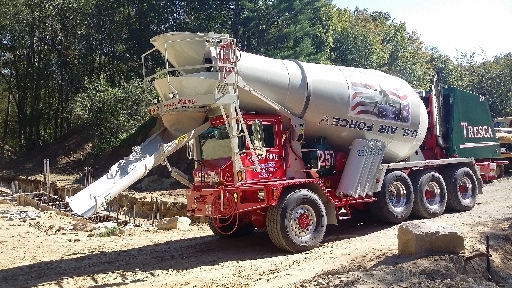 By good fortune the loam company was willing to truck it if we loaded it for them. 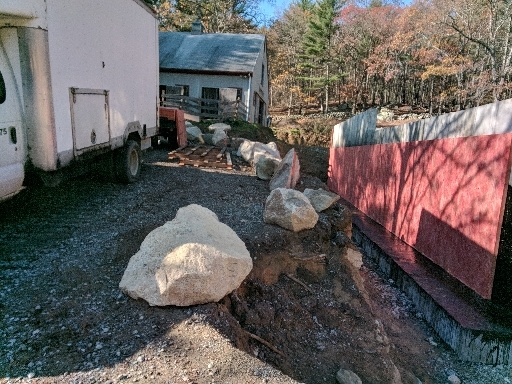 All the smaller rocks were carted away. There are certainly more to come. 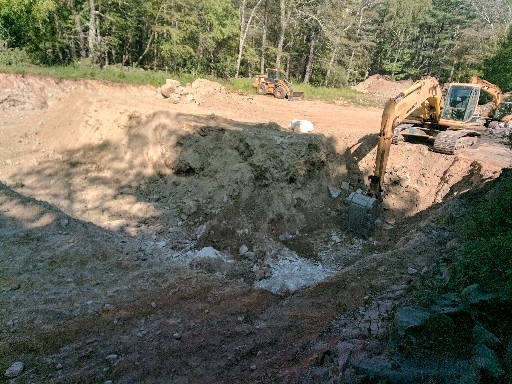 The large rock in the right foreground will have to be split before it can be moved. 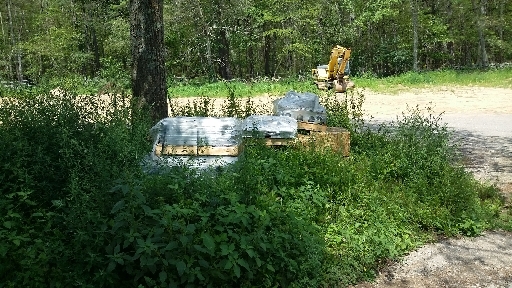 The materials for the arena are delivered. 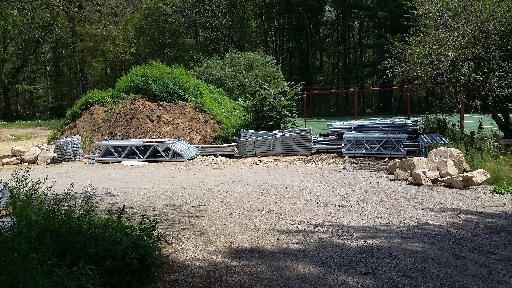 More materials for the arena. 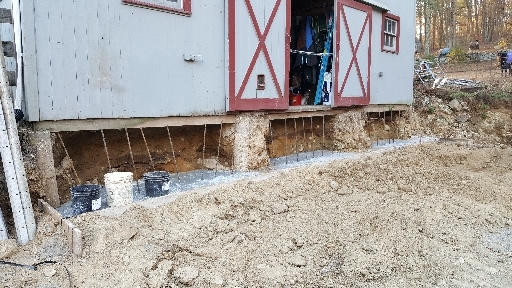 The digging here is to form the bottom of the barn foundation. 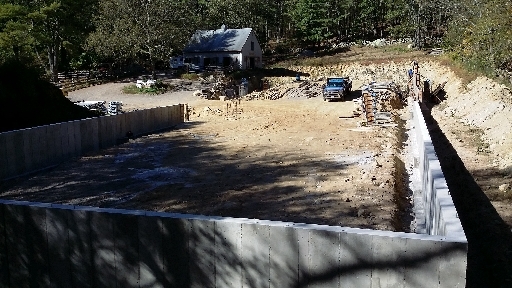 That foundation is buried 4 feet below the eventual barn floor. 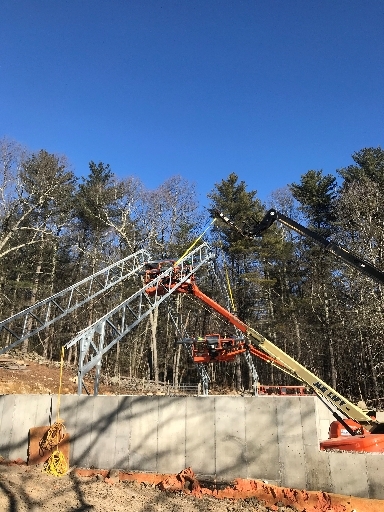 The wall that gets built where the tape is stretched will be 14 feet high. The tape is about 10 feet up the wall. 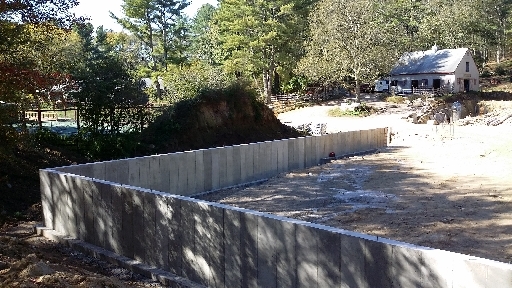 This wall forms the end of the arena and is the foundation for one side of the barn. 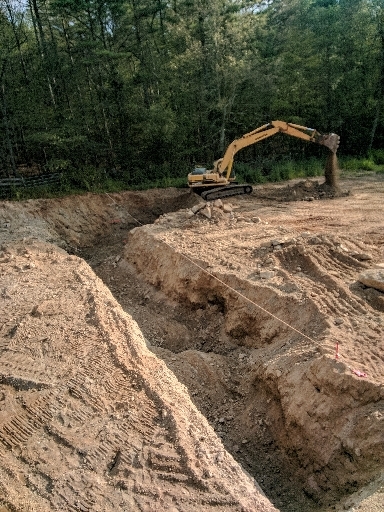 Digging the trench for the frost wall. 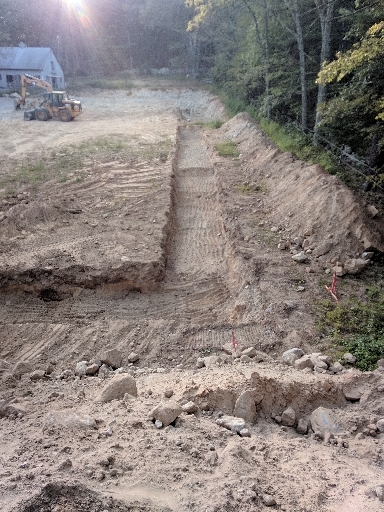 Deep trench for the retaining wall. Lots of rock. 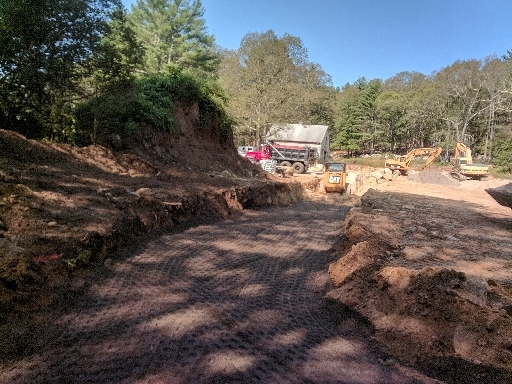 Putting in and compacting dense grade for footing base. 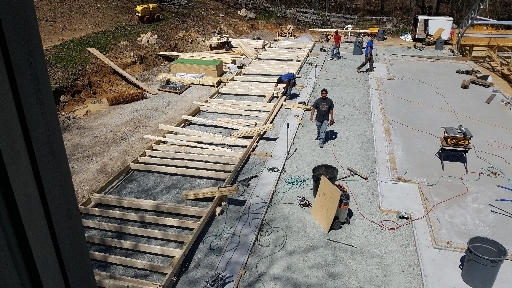 Footing base completed at south end of frost wall. 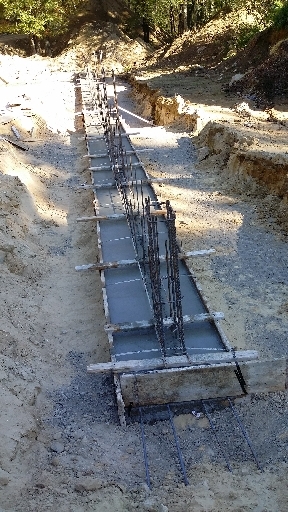 Looking north with footing base in place. 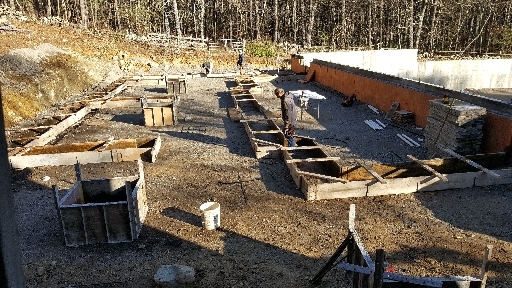 October 2nd, 2017 first concrete delivery for the southern frost wall footings. This brand new truck brought the first load. It was the first day on the job for the truck, we were one of the first if not the first delivery it made. 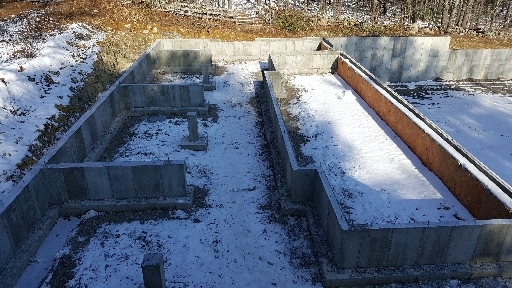 This is what the forms looked like just before the concrete was poured. 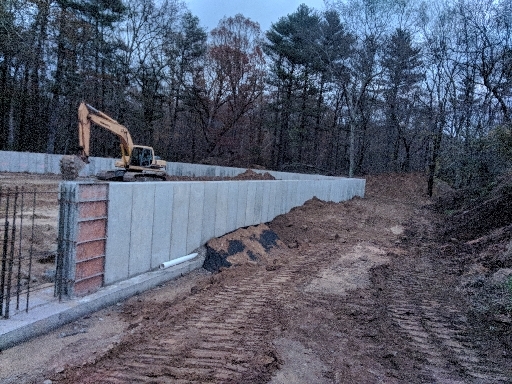 Here is the frost wall with footing concrete completed. North west footing with forms. Rebar sticking up at the top right is the top of the retaining wall. 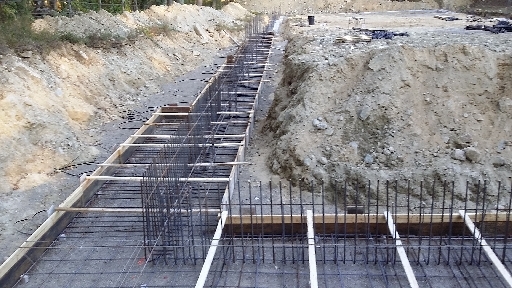 This is the north end of the footings ready to pour. 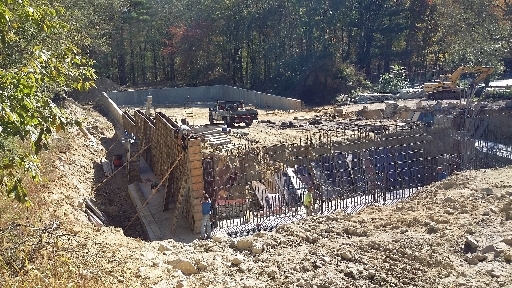 Note the rebar sticking up which will become the north end retaining wall. South end wall about two thirds set up. 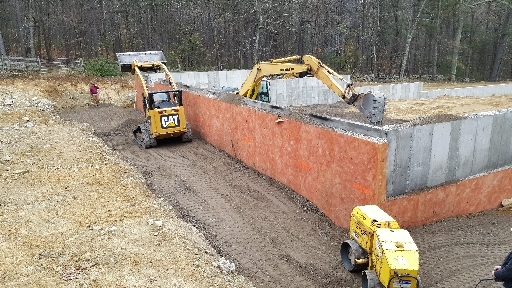 Building the tall retaining wall at the north end. 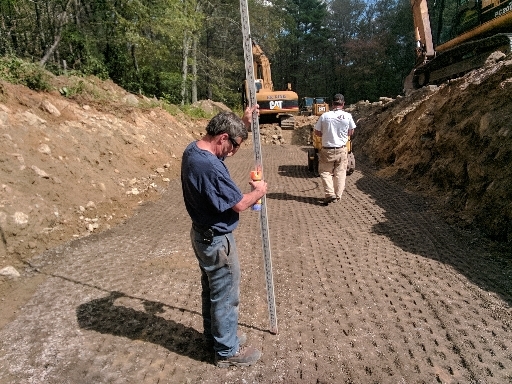 The steel plus footing ends up being 14 feet high. This shows the whole ring. 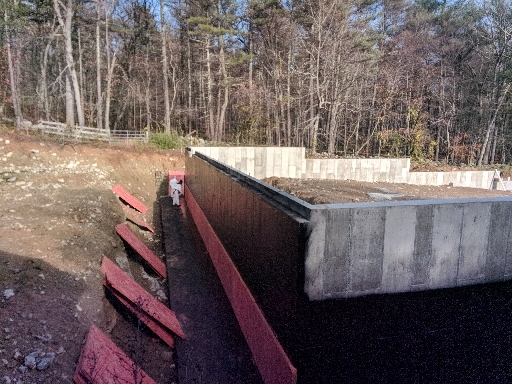 The top of the wall near the camera is the height of the riding surface. 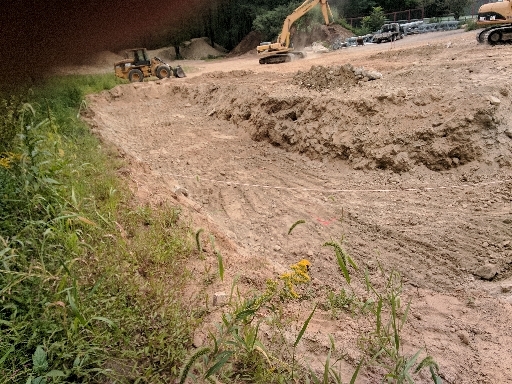 This is 10 feet lower than the floor of the barn left of center in the background. The eight feet of frost wall shown here is completely covered with dirt. The riding surface is at the top of the wall. 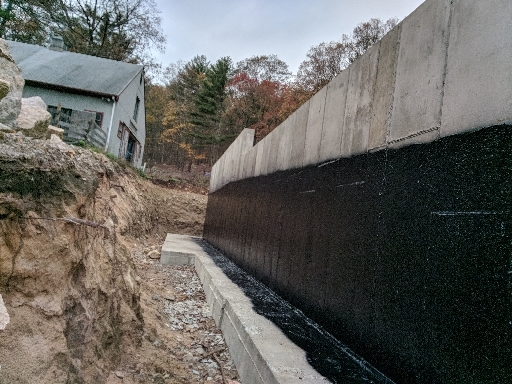 Water barrier on retaining wall. Adding the drain board insulation. 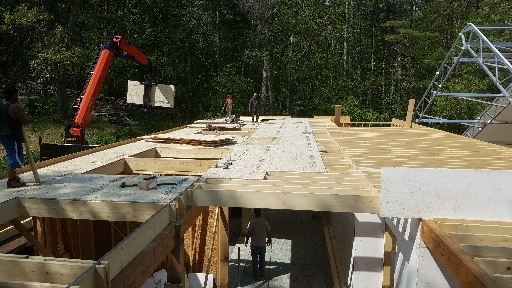 Completed drainage board insulation on the west side. 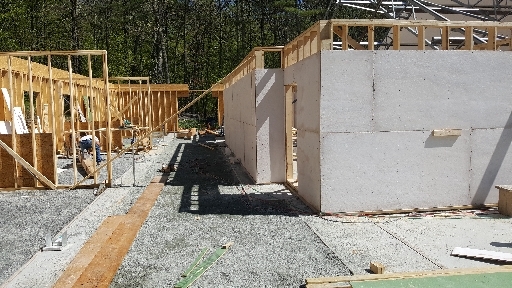 The pink board is insulation that is also drainage board. 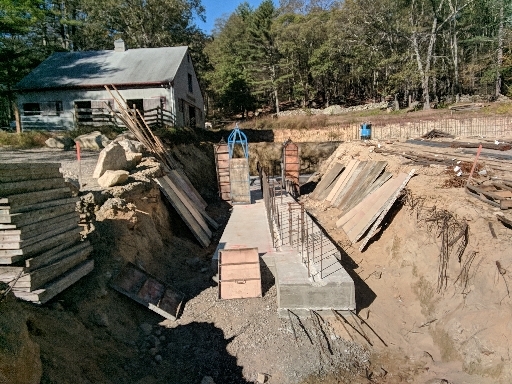 Under the edge of the existing barn is concrete underpinning that supports the old barn and will also become the foundation wall for the new barn structure that sits next to the old barn. 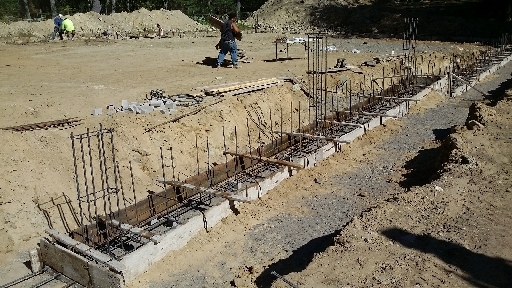 Forms for the footings in the new barn. 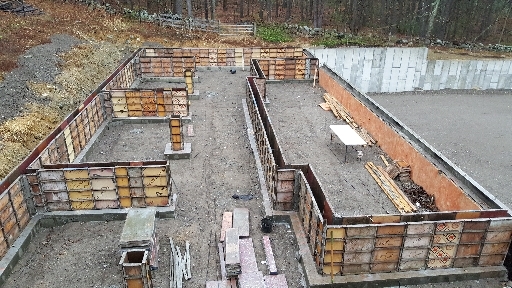 Forms for the walls and supports in the new barn. 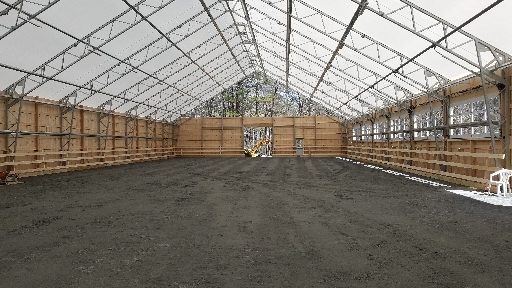 The enclosed area at the right becomes the heated space, the tack room. 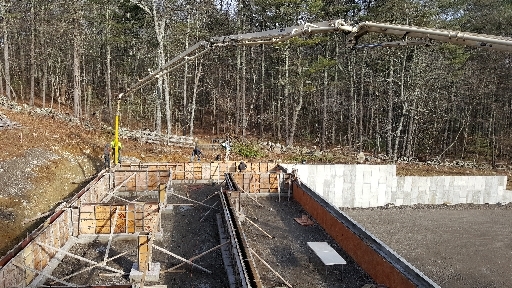 Concrete is pumped a long distance to fill the wall forms. 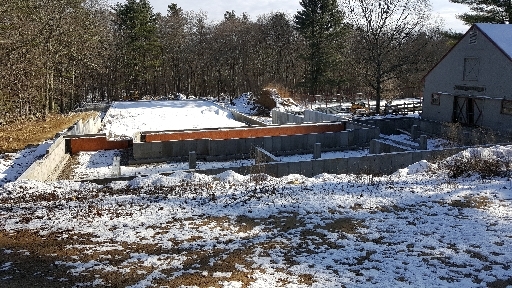 Completed foundation for the new barn. 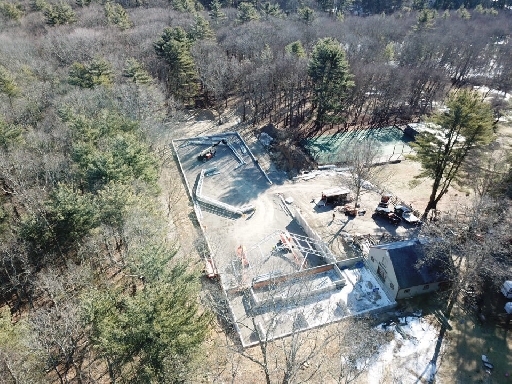 New barn and arena foundations beyond with the old barn to the right. 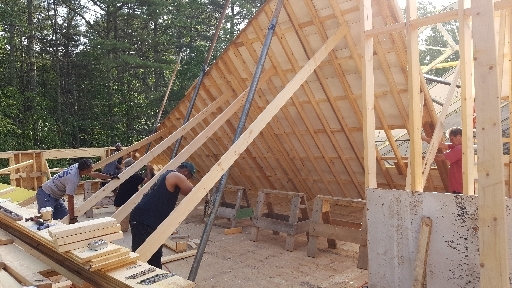 The first trusses get erected. 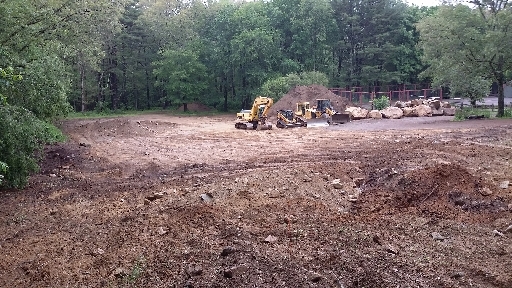 View of the barn and arena site. 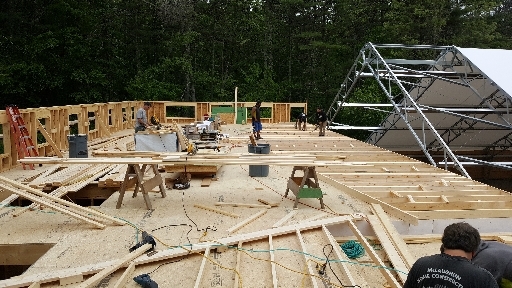 Note the first trusses have been erected. 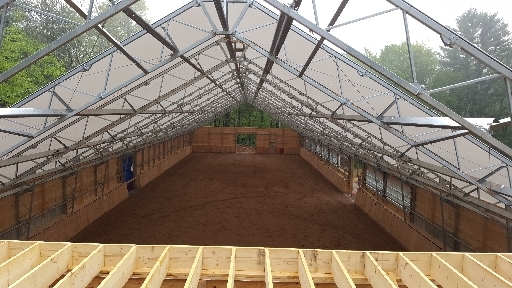 Completed arena viewed from 2nd level of the barn where the apartment will look into the ring. 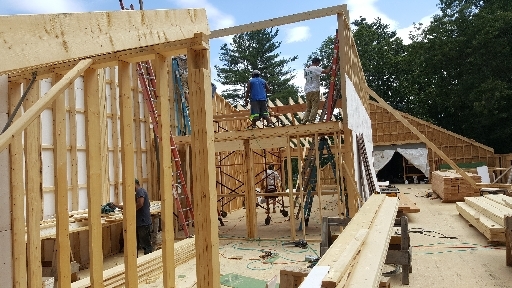 Adding the outside wall of the second level. Looking down the aisle. Grooming stalls are near right. 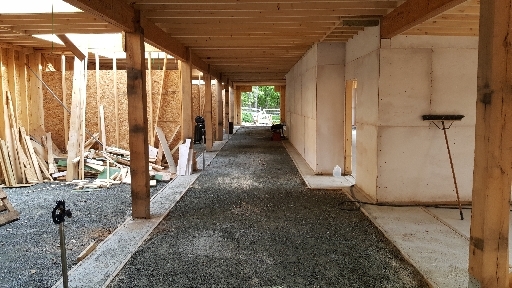 Tack room behind the walls to the right and stalls to the left. 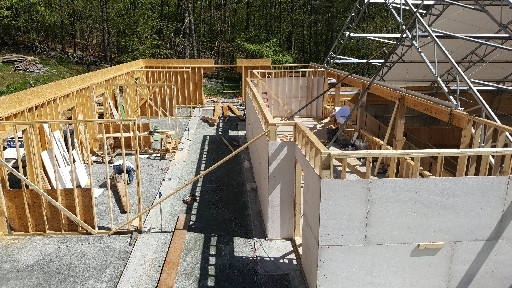 Start of the 2nd floor walls. 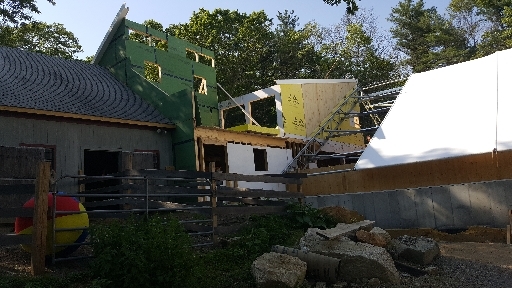 Second floor looking at old barn. 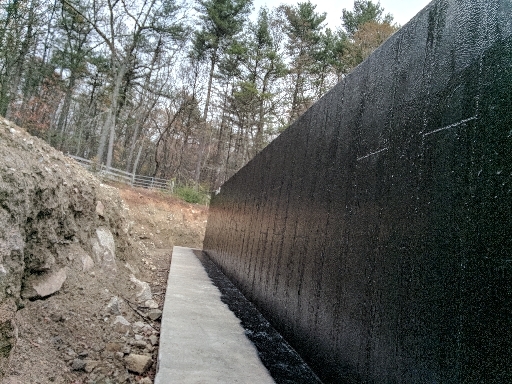 The long wall next to the arena is built flat and folded up after it is complete. 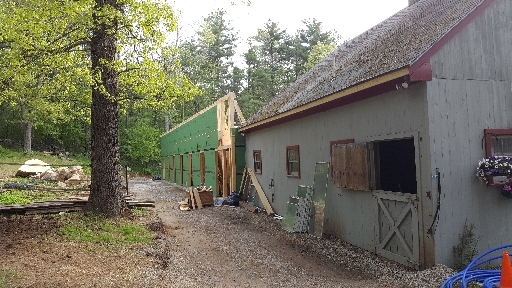 The new barn takes shape between the old barn and arena. 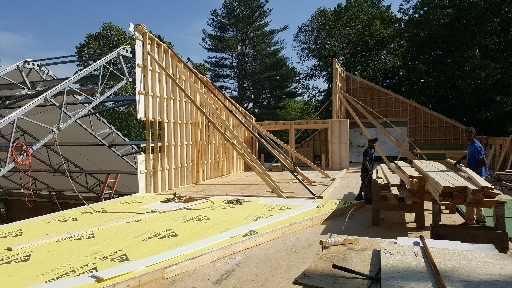 Erecting the second half of the arena wall (second floor of the barn). 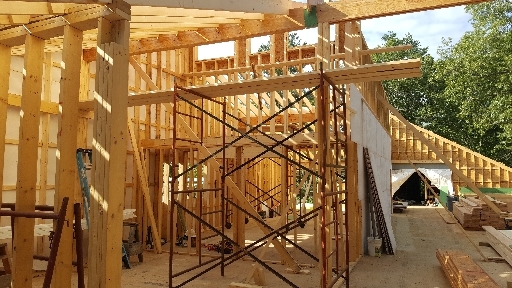 Apartment Framing with roof rafters is complete. 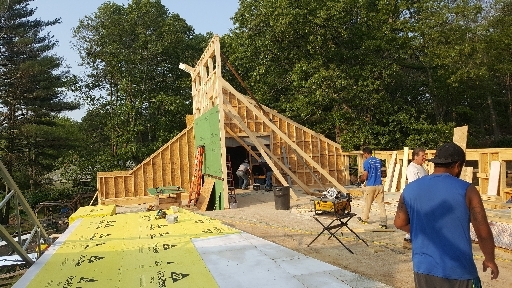 More photos from Wildstar Barn Construction.